Appearance : PALE YELLOW LIQ. WE PRODUCE HIGH QUALITY MICRONISED LIQ. 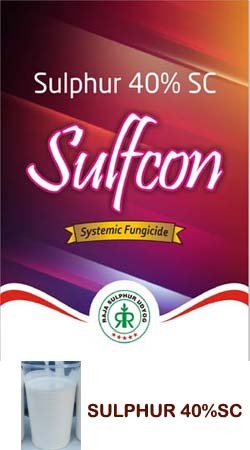 SULPHUR SUSPENSION CONCENTRATES FOR AGRICULTURE AND INDUSTRIAL USES, AS PER BUYER SPECS. PLEASE CONTACT IS FOR BULK SUPPLIES / JOB WORK. WE UNDERTAKE JOB WORKS FOR ANY SC / WDG FORMULATIONS IN INDIA & EXPORT.